Having undergone a rejuvenating treatment of its own, the Delaire Graff Spa is launching a bespoke wellness menu and revitalised facilities available from 1 October 2018. 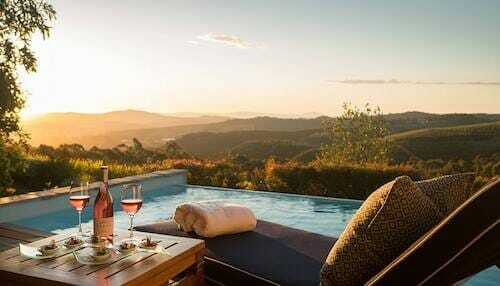 Elevated against the majestic Botmaskop Mountain, surrounded by breath-taking vineyards, exquisite art and endless beauty, the Afro-Asian inspired spa is a tranquil sanctuary where the journey to total wellbeing begins. 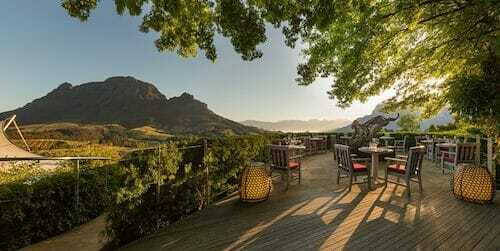 “The Delaire Graff Spa offers a holistic experience from beginning to end, where our ultimate goal is to transform and heal”, says Hildegard Carstens, Delaire Graff Estate’s new Spa Manager. Carstens leads a team of skilled therapists whose expert hands guide guests in luxurious spa rituals, pampering and wellness. With over 18 years of experience in the health and beauty industry, Carstens has left her mark on highly-regarded establishments around the world, including The Athenaeum Spa in Green Park and Michael Van Clarke Salon in Mayfair London as well as Le Quartier Français and Leeu Collection Spa in Franschhoek. 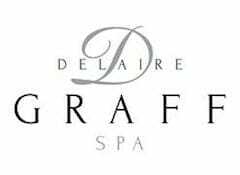 Holistic healing is the essence of her inspiration at Delaire Graff Spa, influenced by her studies which include Cranio Sacral therapy, Reiki, Chakra balancing and visceral manipulation, with Reflexology being her specialty. Carstens has conceived a unique philosophy for the spa, with a holistic approach to beauty, relaxation and wellness. Drawing inspiration from ancient Eastern philosophies, its menu is centred around energies (chi) with treatments focused on life-giving elements, earth, fire, water, air and space. Spa rituals are designed to leave the body, mind and soul glowing, through the use of sound therapy with Koshi chimes, specialised instruments such as petrified wooden tools and African combs, as well as exquisite ingredients including organic oils, diamond dust, nano gold and collagen. Offering a range of innovative treatments, rituals are crafted using the finest range of globally-renowned beauty products. New to the Spa, Dr. Barbara Sturm’s advanced molecular cosmetics offer a new generation of treatments with a clear focus on skin rejuvenation, and Terres d’Afrique present an organic, sustainably-developed skincare range that evokes Africa’s earthfullness. Set in invigorating yet serene surroundings, the spa features five elegant suites that have been refreshed with exquisite linens and unique touches. Guests can unwind in the relaxation room and admire original artworks from Laurence Graff’s personal collection, by some of Africa’s most celebrated modern and contemporary artists. Those joining for half or full-day spa rituals can also make use of the magnificent 22-metre infinity pool and heated jacuzzi as well as the recently-revamped Swedish sauna and steam room. Unsurpassed views coupled with a new lunch menu from Asian-influenced Indochine Restaurant, make the Spa Terrace the perfect place to pause between treatments. 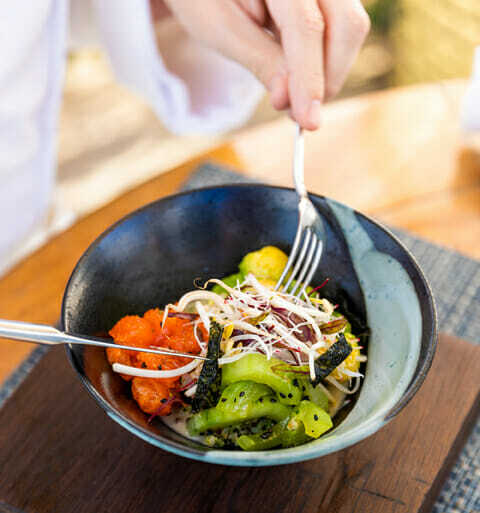 Bursting with light, fresh dishes to nourish from within, the menu appeals to the health-conscious and incorporates vegan and pescatarian options. For an indulgent alternative, luxurious Afro-Asian High Teas may be booked on Fridays with any 60-minute treatment. Sweet and savoury creations are paired with delicate loose-leaf teas and a selection of homemade Kombucha for a uniquely Delaire experience. 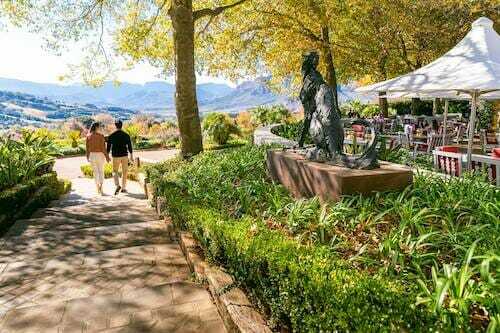 Nestled between majestic mountains and overlooking the vineyards of Stellenbosch, Delaire Graff Estate is South Africa’s most desirable wine, hospitality and art destination. 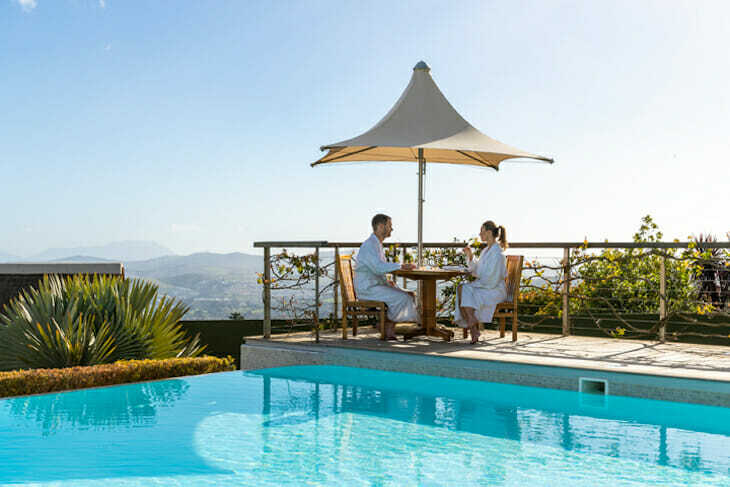 A magnificent Cape Winelands property, it boasts two outstanding restaurants, a state-of-the-art winery, exclusive Lodges and Villa, a destination spa and luxury boutiques.